A popular YouTuber, of The ACE Family channel, is being called out for a series of tweets lampooning Black women. Austin McBroom is the dad behind the popular channel that he started along with his partner Catherine Paiz. The platform, which also features their 2-year-old daughter Elle has over 10 million followers. But now the famous father has some explaining to do after Twitter user @dcnvrs, dug up some racially insensitive tweets from McBroom that took issue with “black chicks” and “light skin” people, BuzzFeed News reports. “If you like em nice rachet [sic], black with the cheeks without morals…the city of St. Louis is for you,” read a tweet from 2013. “Michigan black chicks make California black chicks look like beauty queens !! !” read another tweet. The former fan said he posted the thread with the discriminatory tweets but deleted it for fear of backlash. St. Louis is scaring me away from black girls…..blondes with blue eyes are looking more appealing ! Why r black chicks thick as hell ? 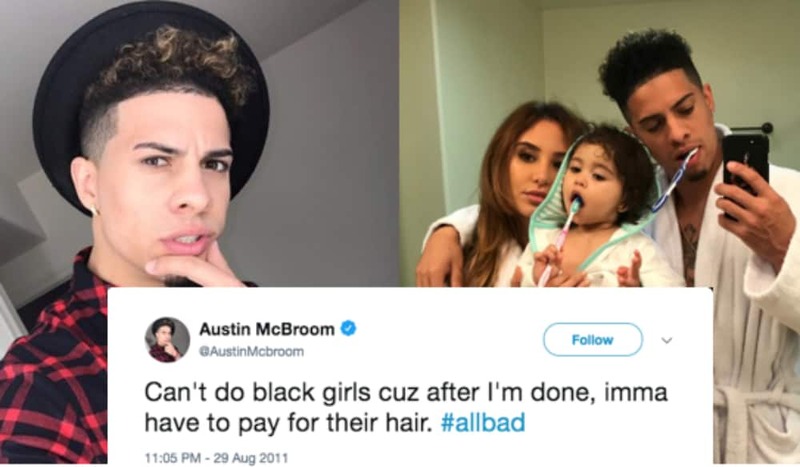 Earlier this year when McBroom was accused of having a color issue, he made a video along with his Black mom, trying to address the racist rumors. “You’re a jokester. I know it was a joke,” his mom said about his immature tweets, some McBroom said were made when he was in high school. Another Youtube dad is under fire this week for pranking his children. Cordero James Brady, 29, the dad behind the popular CJ SO COOL channel posted a video of his children writhing in pain after he gave them ice cream laced with laxatives that made them run to the bathroom to relieve themselves because they had a pretty bad case of diarrhea. While Brady thought the joke was funny enough for his 5.6 million followers to watch and get a kick out of, the cruel practical joke made his children literally sick to their stomach. “My stomach hurts,” screams one of his kids. “Oh my goodness, this boy’s stomach is broken!” Brady jokes at his child’s expense. Laughing at his kids in agony, Brady then films his youngest two children in separate bathrooms, sitting on toilets, doubled over in pain and crying their eyes out as he holds the camera and films. While YouTube has permanently removed the video, the CJ SO COOL channel is still active. DailyMail.com reports that there was in fact an investigation into Brady and his family. “There was a case that was investigated in 2016 involving laxatives and this individual. It was a joint investigation with Clark County Child Protective Services. It was submitted to the DAs office and it was recommended as a criminal case,” said a Henderson Police Department source.